This article is about the modern region of Greece. For the ancient one, see Arcadia (ancient region). For other uses, see Arcadia (disambiguation) and Arkadia (disambiguation). Arcadia has its present-day capital at Tripoli. It covers about 18% of the Peloponnese peninsula, making it the largest regional unit on the peninsula. Arcadia has a ski resort on Mount Mainalo, located about 20 km NW of Tripoli. Other mountains of Arcadia are the Parnon in the southeast and the Lykaion in the west. The climate consists of hot summers and mild winters in the eastern part, the southern part, the low-lying areas and the central area at altitudes lower than 1,000 m. The area primarily receives rain during fall and winter months in the rest of Arcadia. Winter snow occurs commonly in the mountainous areas for much of the west and the northern part, the Taygetus area, the Mainalon. 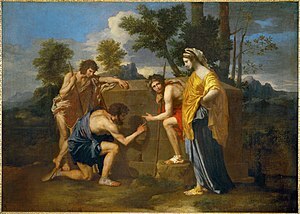 "Les Bergers d’Arcadie" by Nicolas Poussin. After the collapse of the Roman power in the west, Arcadia remained as part of the Greek-speaking Byzantine Empire. Arcadia remained a beautiful, secluded area, and its inhabitants became proverbial as herdsmen leading simple pastoral unsophisticated yet happy lives, to the point that Arcadia may refer to some imaginary idyllic paradise, immortalized by Virgil's Eclogues, and later by Jacopo Sannazaro in his pastoral masterpiece, Arcadia (1504); see also Arcadia (utopia). After the Fourth Crusade, the area became a part of the Principality of Achaea, but was progressively recovered by the Byzantine Greeks of the Despotate of the Morea from the 1260s on, a process that was completed in 1320. The region fell into the hands of the Ottoman Turks in 1460. With the exception of a period of Venetian rule in 1687–1715, the region remained under Turkish control until 1821. The Latin phrase Et in Arcadia ego, which is usually interpreted to mean "Even in Arcadia there am I", is an example of memento mori, a cautionary reminder of the transitory nature of life and the inevitability of death. The phrase is most often associated with a 1647 painting by Nicolas Poussin, also known as "The Arcadian Shepherds". In the painting the phrase appears as an inscription on a tomb discovered by youthful figures in classical garb. Commander Panagiotis Kephalas raising the Maniot flag in Tripoli (Tripolitsa), the capital of Arcadia, after the successful siege. Arcadia was one of the centres of the Greek War of Independence which saw victories in their battles including one in Tripoli. After a victorious revolutionary war, Arcadia was finally incorporated into the newly created Greek state. Arcadia saw economic growth and small emigration. In the 20th century, Arcadia experienced extensive population loss through emigration, mostly to the Americas. Many Arcadian villages lost half their inhabitants, and fears arose that they would turn into ghost towns. Arcadia now has a smaller population than Corinthia. Demographers expected that its population would halve between 1951 and the early 21st century. The population has fallen to 87,000 in 2011. An earthquake measuring 5.9 on the Richter magnitude scale shook Megalopoli and the surrounding area in 1965. Large numbers of buildings were destroyed, leaving people homeless. Within a couple of years, the buildings were rebuilt anti-seismically. This earthquake revealed an underground source of lignite in the area, and in 1967 construction began on the Megalopoli Power Plant, which began operating in 1970. The mining area south of the plant is the largest mining area in the peninsula and continues to the present day with one settlement moved. In July and August 2007 forest fires caused damage in Arcadia, notably in the mountains. In 2008, a theory proposed by classicist Christos Mergoupis suggested that the mummified remains of Alexander the Great (not his actual tomb), may in fact be located in Gortynia-Arkadia, in the Peloponnese of Greece. Since 2008, this research is ongoing and currently being conducted in Greece. The research was first mentioned on CNN International in May 2008. When, during the Greek Dark Ages (c. 1200 BC–800 BC), Doric Greek was introduced to the Peloponnese, the older Arcadocypriot Greek language apparently survived in Arcadia. Arcadocypriot never became a literary dialect, but it is known from inscriptions. Tsan is a letter of the Greek alphabet occurring only in Arcadia, shaped like Cyrillic И; it represents an affricate that developed from labiovelars in context where they became t in other dialects. The Tsakonian language, still spoken on the coast of modern Arcadia (but in the Classical period considered the southern Argolid coast immediately adjoining Arcadia), is a descendant of Doric Greek, and as such is an extraordinary example of a surviving regional dialect of Greek. The principal cities of Tsakonia are the Arcadian coastal towns of Leonidio and Tyros. As a part of the 2011 Kallikratis government reform, the regional unit Arcadia was created out of the former prefecture Arcadia (Greek: Νομός Αρκαδίας). The prefecture had the same territory as the present regional unit. At the same time, the municipalities were reorganised, according to the table below. The main towns in modern Arcadia are Tripoli, Astros, Vytina, Dimitsana, Lagkadia, Tyros, Leonidio, Levidi, Megalopoli and Stemnitsa. Ancient cities include Acacesium, Asea, Astros, Athinaio, Daseae, Falaisia (Phalesia), Gortys, Hypsus (Stemnitsa), Heraia, Lusi, Lykaio, Lycosura, Mantineia, Megalopolis, Orchomenus (Orchomenos), Tegea, Thoknia, Trapezus, Trikolonoi, Tropaia, Tripoli, Tyros, other cities includes Basilis, Caphyae, Charisia, Ellison, Enispe, Kaous, Karyes, Methydrio, Melangeia, Oryx, Paroria, Pelagos, Rhipe, Stratia, Teuthis and several more. Cities which once belonged in Arcadia include Alea (now in Argolis), Amilos (now in Achaia), and Phigalia (now in Elis). A thermoelectric power station which produces electricity for most of southern Greece, operates to the south of Megalopolis, along with a coal mine. In agriculture, potato farms (dominant in central and northcentral Arcadia), mixed farming, olive groves, and pasture dominate the plains of Arcadia, especially in the area around Megalopolis and between Tripoli and Levidi. The Moreas Motorway (A7, E65) highway connects Tripoli with Corinth and Athens. It is being extended further southwest to Megalopoli and Kalamata. Arcadia has two tunnels. The Artemisio Tunnel opened first, followed by the tunnel east of Megalopolis; both serve traffic flowing between Messenia and Athens. Asteras Tripolis is the Greek soccer club from the city of Tripoli. Arkadikos B.C. is the basketball team based in Tripoli, founded in 1976. Philopoemen (253–183 BC), Greek general and statesman, Achaean strategos, known as "the last of the Greeks"
Theodoros Kolokotronis (1770–1843), Field Marshal in the Greek War of Independence (1821–1832), he was raised and lived in Arcadia (Libovisi). The word Arcadia has become a poetic idyllism meaning "utopia". Sir Philip Sidney (1554–1586) wrote The Countess of Pembroke's Arcadia, a combination of pastoral romance and poetry, for his sister, Mary Sidney. It was hugely popular for over a century. Arcadia is the name of a prize-winning play by Tom Stoppard (1993). The Greek and Latin name Arcadius (Arkadios) was derived from "Arcadia" (see the Emperor Arcadius, the grammarian Arcadius of Antioch, the patriarch Arkadios II). From Greek it passed in Russian, Ukrainian, and other Slavic languages, where it is a common male name as Arkady or Arcady. The area of the prefecture were featured in several ERT programs including documentaries on the Megalopoli Mine and Ladon Lake. Marianas Trench refers to Arcadia, in their 2009–2010 song "Acadia", referring to it as a "unspoiled, harmonious wilderness". The 2014 TV series Resurrection takes place in a real town, Arcadia, Missouri. The choice of setting likely is a reference to the Latin phrase Et in Arcadia ego, since the premise of the show deals with questions of life, death, and people being resurrected from the dead. The Greek musician Demis Roussos released a song in 1978 titled "Lovely Lady of Arcadia". The game Bioshock features a level and setting named Arcadia, which is a reference to the geography and landscape similarities. The game Life is Strange takes place in the fictional Oregon town of Arcadia Bay. On 9 August 2017 BBC 4 broadcast In search of Arcadia a television documentary featured a 12 miles (19 km) section of the River Thames. Arcadia is a piece of mythical software that is trying to be developed by a large advertising agency. 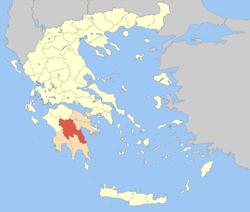 Arkadia is one of the regions of Greece that can be conquered/defended by either Athens or Sparta in the 2018 video game Assassin's Creed Odyssey. The region is considered a principal Greek breadbasket during the ongoing Peloponnesian War. ^ "Alexander the Great New Research: Are His Mummified Remains In Gortynia-Arkadia, Greece?". Ireport CNN. 2008-05-20. Retrieved 2013-01-06. ^ "Alexander the Great Discovery-New Important Research Conducted in Greece". Ireport CNN. 2008-02-22. Retrieved 2013-01-06. ^ "In search of Arcadia". BBC Media Centre. Retrieved 10 August 2017. ^ "DreamWorks Tales of Arcadia Trilogy Planned for Netflix with Trollhunters Spin-off Series". Collider. Retrieved 8 July 2018. Wikivoyage has a travel guide for Arcadia (Greece). Wikimedia Commons has media related to Arcadia, Peloponnese.